We offer our clients a wide range of Water Paper Cups. These are fabricated from top quality paper pulp sourced from reliable vendors. We offer these in various designs and in both plain and printed to meet the exact requirements of clients Our cups are extensively used in parties and functions for water and other beverages. 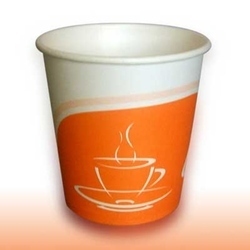 We are renowned for the premium quality Water Paper Cup that we process from ITC Paper pulp. Adorned with pleasing printing designs and stunning Logo printing . With Paper Thickness 185GSM-275GSM this range is strong and does not wilt easily. These cups can be used for coffee/tea/juice and any cold & hot beverages. Affordable price and customization facility that we offer is highly appreciated by clients. Looking for Water Paper Cup ?